Zaatar is the bitter herbs eaten by the Israelites on their flight from Egypt. Zaatar is the Arabic term for thyme and the generic term for a spice blend of thyme, sumac (generally unavailable in the U.S.), toasted sesame seeds and salt. Zaatar is most often rolled onto Shonklish (recipe in grandma’s Cookbook), but don’t miss the opportunity to use it on everything else. Add olive oil to Zaatar and mix to a paste-like consistency. 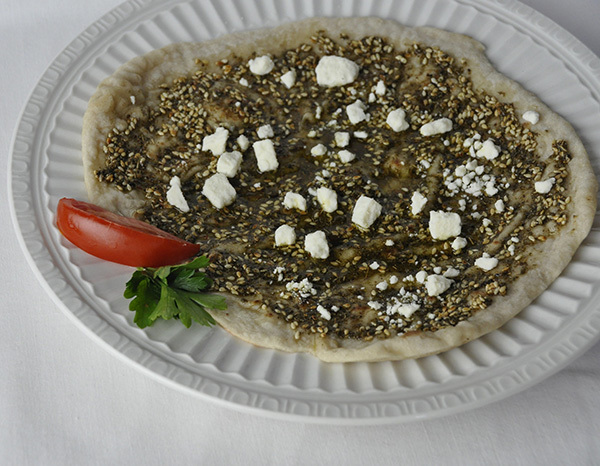 Spread Zaatar on any flat bread and toast. Crumble feta cheese, top with Zaatar, and pinch with pita bread. Spread Zaatar on a pizza shell, top with sliced tomatoes and crumbled blue cheese. For an exquisite appetizer, spread Zaatar on gyro bread, add goat cheese, roasted red peppers and rock shrimp. Sprinkle dry Zaatar on eggs. Sprinkle dry Zaatar on a tossed salad, it’s a whole new experience!